PERUMIN 33 - Mining Convention will be held in Arequipa from September 18 to 22, 2017, at the National University of San Agustín, Arequipa, Peru. If interested in participating, please visit www.convencionminera.com, to register on-line and complete your registration form. The attendants must fill out entirely the registration form, otherwise the ON-LINE registration process will proceed. The attendants must have paid in full their registration or service, before the beginning of the event, otherwise, no access to PERUMIN will be granted. The IIMP member that would like to register to PERUMIN with the Conventionist IIMP fee shall have a membership of minimum 3 months and be up-to-date in their 2017 payments. The IIMP member older than 65 that would like to register to PERUMIN with the Conventionist IIMP Member 65 + fee shall have a membership of minimum 3 months and be up-to-date in their 2017 payments. Valid only for individuals. The first time an attendant is changed will be free of charge. As from the second change, a penalty equal to 20% of the registration fee will be charged. In both cases, the change procedure shall be done with prior coordination and authorization of the Head of IIMP Events. No change of attendants may be done after retrieving the material. Students fee is applicable to 10th term university students and who are in the fifth top rank of their undergraduate class. A university certificate must be provided. Limited capacity: 300. Professors shall submit a letter from the university where they teach. Please bear in mind that the professor must have a tenure or be on full-time work. This is not valid for Graduate professors. Credentials are the documents that allow the identification of attendants during the event regarding the attending category and are composed by the badge and access control bracelet. The replacement of lost or stolen credentials will have an additional cost of S /. 100.00 or USD 35.00. Attendants’ credentials are personal, non-transferrable and MANDATORY Credentials must be worn in sight at all times during the event. Credentials collection is PERSONAL, in case of a company’s representative, he or she shall show an authorization letter to collect credentials signed by the legal representative. The letter shall state the information of the person that will collect the credentials, together with the attendants’ information. The attendant may use the Official Travel Agency services, which can provide him or her with information regarding air and land transport, lodging and other services. It is hereby certified that the Official Travel Agency is not related to the Peruvian Institute of Mining Engineers - IIM, and therefore the IIMP shall not be responsible for the actions, contracts or actions generated between the Agency and the Attendant. Banking Fees must be paid by the attendant and the company. If the registration is done before the event, the attendant must attach a copy of the deposit or bank transfer, stating the amount and name of the attendant or company. If the registration is during the event, the original payment voucher must be submitted to validate the process. The IIMP shall not be responsible for any non-identified deposits. Limited hotel booking by the organization committee of PERUMIN - 33 Mining Convention. The participant will bear the costs. In case of no availability, the attendant shall look for a hotel by himself. Address: Los Canarios N° 155-157, Urbanización San César, La Molina. Address: Universidad Nacional San Agustín (UNSA) - . Av. Venezuela S/N - Arequipa. He represents the IIMP in all cases, in case the attendant has registered to PERUMIN and is the individual responsible to supervise the strict compliance with the service provided to the attendance, in accordance with the IIMP regulations. Any cancellation shall bear a penalty of 50% of the registration fee as of August 31, 2017. For cancellations after September 1, 2017, no refund will be applied. Active IIM Members that would like to attend, have up to 20 calendar days of credit to pay their registration fees, upon reception of the invoice. The attendant must pay the invoice to be able to receive his credential and material. Attendants shall provide us with all the necessary documents to issue the corresponding invoice. For example, a Purchase Order, if applicable. Any individual or company that is not an IIMP Member shall pay the registration fee within the 48 hours after the registration. It is MANDATORY to state the Corporate name if an invoice (factura) is needed. For National Companies, state by SUNAT (Tax Administration Agency), the attendant shall deposit the 10% of the total amount (Detraction), to the Bank Account of the Peruvian Institute of Mining Engineers, in the Banco de la Nación (Retentions account - National Currency - No. 00000372668) or we will do the self-detraction. Once the type of receipt is requested, no changes will be allowed. Perumin accepts VISA and MASTERCARD (Mastercard, American Express, Diners, Saga, Ripley and any Credit card from any bank) so you make your purchase in a safely manner. The online payment with the above-mentioned cards will be done only AFTER COORDINATING WITH THE IIMP, since this option is subjected to technical availability. The payment may be done by deposit to the IIMP bank accounts stated on the next paragraph, for this the attendant shall previously request an invoice. The request shall be confirmed by phone or email, which must state the payment conditions. Only the amount in the bank accounts will be considered, but not the bank charges of your bank or the intermediary bank. Any bank charge shall be paid by the attendant or the company. The IIMP shall not be responsible for the failure to comply any of its obligations due to any act of God or force majeure. For these purposes, acts of God or force majeure are understood as any non-attributable cause consistent in an extraordinary, unforeseeable and irresistible event, preventing the rendering of services or that will determine its partial or late or faulty compliance. Among such events are included fires, earthquakes, tremors, tsunamis, landslides, avalanches, floods, storms, heavy rains, explosions, armed conflicts or internal or external wars, civil commotions, blockades, acts of terrorism and sabotage, uncontrollable delays in transportation, strikes and lockouts, as well as any other similar or different cause, extending the current relationship is merely by way of example and not limitation, for which all events beyond the reasonable control of the parties and that could not have been foreseen or when foreseen, they could not be avoided and for the loss or damage caused to equipment, tools and material are included. If the Event is cancelled up to 270 days before the start date the IIMP will refund the ATTENDANT an amount equivalent to the 80% of the total payment, as long as the total payment has been paid at the cancellation date, otherwise, the paid amounts that do not exceed such percentage will be refunded. If the Event is cancelled up to 180 days before the start date the IIMP will refund the ATTENDANT an amount equivalent to the 54% of the total payment, as long as the total payment has been paid at the cancellation date, otherwise, the paid amounts that do not exceed such percentage will be refunded. If the Event is cancelled up to 180 days before the start date the IIMP will refund the ATTENDANT an amount equivalent to the 27% of the total payment, as long as the total payment has been paid at the cancellation date, otherwise, the paid amounts that do not exceed such percentage will be refunded. Credentials will be seized and the access to the Event venue shall be forbidden in case an invalid badge is identified, or one that does not correspond to the attendant. All of the attendants must have paid in full their registration or service, before accessing the Event venue; otherwise, no access will be granted. Every attendant shall identify himself with his Badge and access control bracelet. EXTEMIN per day, EXTEMIN visitor per week, EXTEMIN additional and gests of the companies, may only access the Fair. (1) The IIMP, to register as a Conventionist IIMP Member shall be a member for at least 6 months and not owe any membership payment. (2) Applicable only to the lecturer of Technology and Research Meeting. (3) Professors shall submit a letter from the university where they teach. (Full-time) .Not applicable to Graduate professors. (4) The student shall be at 10th semester and ranked in the top-fifth tier of his undergraduate class, duly documented. Limited capacity: 300. 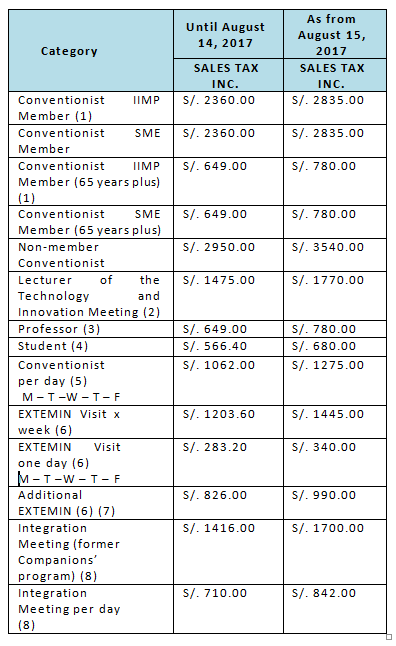 (5) Access to all activities of the Convention, on the selected date. (7) Only for companies with a stand. 3 additional registrations, as a maximum. (8) Access to all the convention activities or to the Mining Technological Fair - EXTEMIN not included.